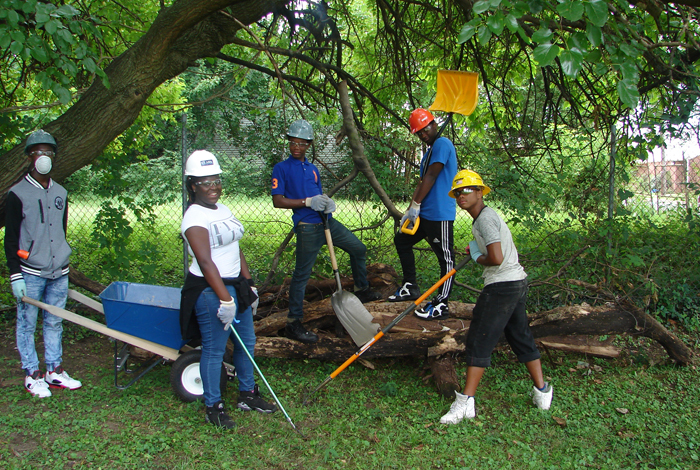 AT THE READY ACAD Summer Academy students on cleanup day two of the ‘Adopt-a-Neighbor’ program. It’s just after 10 a.m. on a Thursday, and six students are cleaning up fallen tree debris at a home on the corner of 46th and Lee streets in Northeast Washington, D.C. “Somebody break that up,” says one young man as he wrestles with a tangle of branches and vines. Another teen kicks at the limbs, snapping them into smaller pieces before tossing them into a nearby blue wheelbarrow. These students are part of a small group spending their summer break working at the ACAD Summer Academy, a skill-building program housed at IDEA Public Charter School. Open only to students already enrolled in the Academy of Construction & Design at IDEA, the program mixes hands-on learning with academics and is designed to give young men and women “real world” work experience in career and technical education, all while learning the importance of community service. 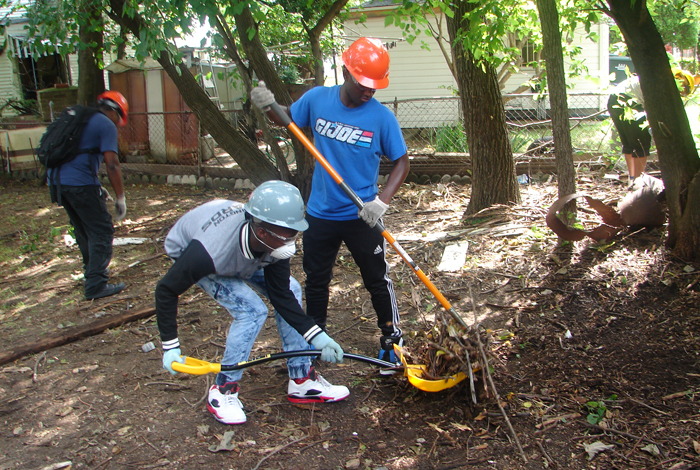 On this July day, 10th-graders are cleaning up the yard of Deanwood community resident Rose Warren, chosen as the program’s first “Adopt-a-Neighbor” recipient. She praised the program for teaching students responsibility, something about which they are equally proud. While admitting the hours are long, the work challenging, and the days hot, student Kyeon Ford said he “feels good” about helping Warren. “It gives me that good-deed-of-the-week feeling,” said Ford, as he took off his gloves for a short water break. GIVING BACK (From left) Alex Tillery and Tyron Gross remove tree debris from the yard of Deanwood resident Rose Warren. Ford is one of 11 students – ages 14 to 16 – working with the Academy’s summer program at IDEA, a host site for the city’s broader summer youth jobs initiative. Because of the affiliation with the citywide employment program, ACAD students are paid for their efforts, $5.25 to $8 an hour, according to Shelly Karriem, director of the Academy of Construction & Design. During the six-week program — running June 27 to Aug. 5 — students will be completing the interior of the micro-house project, a 160-square-foot tiny house. With the electrical and plumbing already finished, the next steps include installing wall insulation and constructing a drop-down table from leftover cedar planks from a separate landscaping project. An emphasis of the ACAD Summer Academy, however, is to reinforce basic construction math skills that may be lost when school’s out. “We really focus on the math because that’s what employers of companies tell us they will need on the job site,” explained Karriem, noting that the curriculum stresses addition, subtraction and measurements. The math component also stresses financial literacy, teaching students the differences between banks and credit unions, credit and debit cards, and checking and savings accounts. It also includes a primer on establishing credit. But educating teens about job protocol is equally important. At the start of their summer jobs, students were given a code of conduct to teach proper workplace dress and behavior. “This is a real job. We don’t want to hear from your mother,” said Karriem, stressing that students need to call in themselves if they are running late or can’t come to work. Students also learn “soft skills” like how to communicate effectively with their peers and the value of teamwork, which is demonstrated through Adopt-a-Neighbor.